The country of Italy has brought us many inventions over time, but few have brought us so much joy as pasta and pizza. Historians have coined a catch phrase for this spreading of food all over the world. They call it the “Columbian exchange.” Only thanks to Christopher Columbus, who brought the tomato to Europe, could Italians develop their pasta and pizza sauces based on the red vegetable. When we think about pasta sauce, the traditional tomato sauce called “marinara” comes to mind. But there are plenty of pasta sauces that incorporate not a shred of tomato. The culinary world has to thank the Italians for a lot of wonderful dishes. Food historians think that lasagna—topping the list of most-loved comfort foods all over the world—was already enjoyed by ancient Romans. The tomato did not feature prominently in pasta sauces until the 18th century, thanks to the “Columbian exchange.” From then on, the tomato in form of pasta and pizza sauce, has undertaken a reverse journey, together with millions of Italians. Between 1870 and 1920, five million immigrants had made their way from the Italian boot to the USA. With them, they brought their culinary heritage that was joyously accepted by American citizens of all backgrounds. The Italians even developed some dishes in the USA that had never seen the daylight in their home country. Spaghetti with meatballs in tomato sauce is one of the dishes completely unknown in Italy. The deep-dish pizza also belongs to the American inventions that have incorporated an Italian classic. Even the pasta primavera, the Italian name for springtime, has nothing to do with Italy. Sirio Maccioni, the owner of the famous Le Cirque Restaurant in New York, created it in 1977 for his customers. Like pesto, carbonara, and mushroom cream sauce, the primavera sauce does not incorporate tomato. The primavera is a cream sauce with plenty of garlic and spring vegetables. Pasta sauces come in a mind-boggling number of varieties. Almost every cook sports two or three favorite pasta sauces and most of them don’t use tomato. Why? You can buy a decent tomato sauce in almost every supermarket for a few dollars. Ambitious housewives still make their own tomato sauce for pasta, but most people don’t bother. It is just too easy to open a glass, cook a pot of pasta, and combine the two. The same applies to pizza sauce. This item can be bought everywhere in great varieties, too. However, culinary experts often prefer a simple tomato puree, available in tetra pack or a glass, to a ready-made pizza sauce. The reason is simple: Tomato puree does not impart many extra flavors and lets the toppings of the pizza shine. Some culinary experts swear the best pizza sauce is tinned tomato from Italy, pureed in a blender. However, this discussion applies only to a thin-crust pizza. If you want to prepare one of the typical American deep-dish pizzas, you need a tomato sauce that brings a lot of flavor to the table, to the dish to be precise. 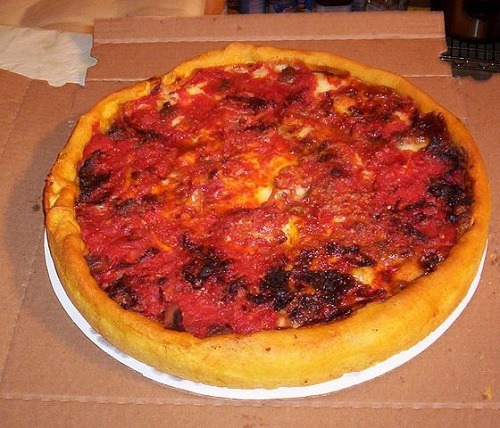 The deep-dish pizza was invented in the windy city of Chicago sometime around 1950. It is not really sure who baked this heavy pizza for the first time. Maybe the owner of Pizzeria Uno in Chicago, Ike Sewell, a former football star, created this calorie-bursting dish that resembles more a pie than a pizza in 1943. Some people believe that pizza-chef Rudy Malnati from the same restaurant did the developing. Whoever it was, the deep-dish pizza belongs to Chicago, and people from all over the USA go there to devour one of the originals. Here is a recipe for a deep-dish pizza sauce easily prepared at home. Place the tomatoes and their juice into a large pot. Crush them with a big spoon or with your hands. Remove any bits of skin and stalks that you might find. Add the olive oil, the oregano, the garlic, the salt, and stir well. Simmer the sauce over low heat for around one hour. It should thicken up quite a bit. If it is too liquid, remove the lid and boil it until it has the right consistency. Stir in the basil leaves and the chili flakes. Use immediately. You can keep it in the fridge for up to three days, or you can freeze it. Kornelia Santoro. "Difference Between Pasta sauce and pizza sauce." DifferenceBetween.net. February 23, 2016 < http://www.differencebetween.net/object/comparisons-of-food-items/difference-between-pasta-sauce-and-pizza-sauce/ >.